Raw honey is honey that has not been filtered or heated in any way. Unfortunately, most of the honey available today has been heavily processed. 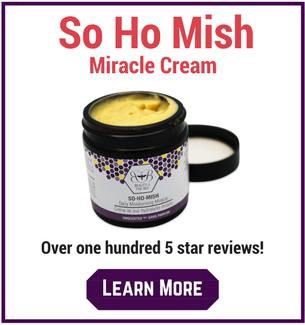 By this I mean it has had the wonderful compounds such as bee pollen, beeswax and propolis filtered out of it. Most will have been pasteurized or heated as well. Like most foods that have been chemically refined, many of the healthful benefits have been reduced or eliminated. 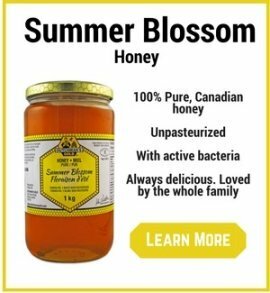 Most commercial and off shore honey is treated with an excessive heating process that can destroy some of the critical natural enzymes, vitamins, and minerals. And many so called 'local' or 'domestic' honeys are in fact small amounts of domestic blended with Chinese or cheap off shore honey. Canadian labeling laws for example allow you to call it 'Canadian' as long as there is some Canadian honey in it. Processing of honey also filters out many vital phytonutrients found in raw honey, products that exist in nature in the hive. First of all, raw honey has not been heated excessively through pasteurization. The only way to get that perfectly clear look of most commercial honeys is to heat it and then filter it excessively. The problem with heat is that many nutrients are very sensitive to it and die. You may get strange looks when you tell people your raw honey is 'alive', but you're absolutely correct to a certain extent. It's the beneficial enzymes found in raw honey that make it so digestible to humans. Raw honey is filtered, but very minimally and in a manor not to destroy the health promoting enzymes and other nutrients. You'll also notice raw honey is solid at room temperature (like honey should be) and it also looks almost milky. It is not a golden and perfectly clear liquid. Let that be a sign to you - the mirky look to your honey is assurance that it still contains it bee pollen granules, bee propolis, vitamins, minerals, enzymes and whatever else raw honey contains that we haven't figured out yet! Remember, if it looks to good to be true, it probably is! When selecting a raw honey for you and your family, make sure the word “raw" is on the label. Or "un-pasteurized." 100% Canadian is reassuring as well (or at least know which country the honey is coming from). 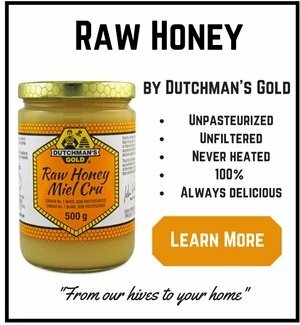 It is extremely rare to hear of raw honey being blended with cheaper off shore honey so if you stick to raw, you should be safe!